Monique Spence, the founder and creative fashion director of Redefine The Tee, models the M.J. Tribute dress. Ever since Michael Jackson's death, not surprisingly, countless entrepreneurs have come out the woodwork sellling everything from hats, to t-shirts to mouse pads. It's American capitalism at its "finest" -- strike while the iron is hot and try to make a quick buck. A Chicago clothing company wasted no time creating a Michael Jackson t-shirt, but with a twist. The proceeds from the MJ Tribute Tee will be donated to the music program at Theodore Roosevelt High School in Gary, where many of the Jackson children attended. Monique Spence, the founder and creative fashion director of Redefine The Tee, created the shirt which shows various Jackson songs written in script surrounded by a sequined white glove. 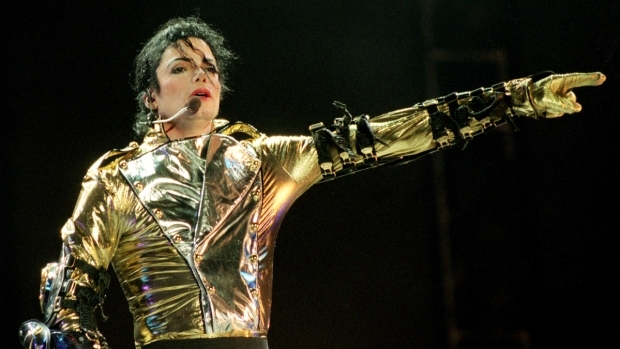 "I wanted to do more for Michael Jackson and the community than design a cute t-shirt. I thought about his humble beginnings in Gary, Indiana and thought it would be great to support young people in that community that are interested in music," says Spence. Spence says she discovered that the school's music was in need of support, so decided to help out. The school participates in Chicago's annual Bud Billiken Parade. The collection features a "ladies cut" scooped neck tee in black for $45, a v-necked tube dress in red & black for $90 and a men's crew neck tee in black for $45. The MJ Tribute Tees are on sale at www.mjtributetee.com and Macy's State Street in Chicago, which now has a second order after selling out over the weekend.